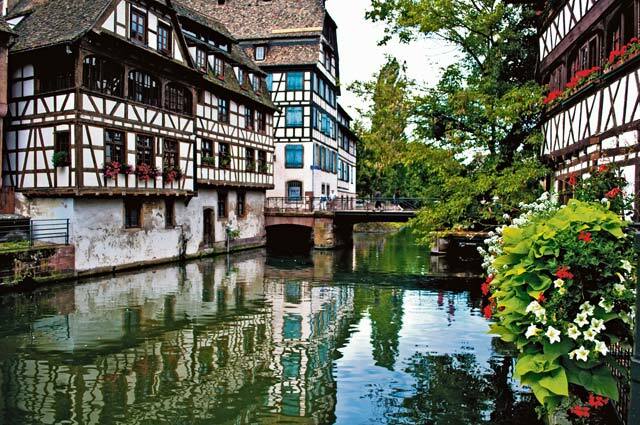 Just across the border in France lies a tiny region called Alsace that almost feels German: half-timbered houses, rolling hills, a strong wine culture, small villages and words you might recognize. It’s all due to years of shifting borders between France and Germany (in the 74 years between 1871 and 1945 alone, the two powers exchanged jurisdiction of Alsace four times). 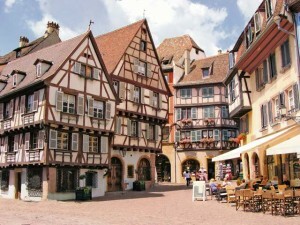 The scenic Alsace Wine Route stretches along the base of the Vosges Mountains for 100 miles from Wissembourg to Thann. Not only does it feel vaguely familiar, making it a great place for a day trip and an even better place to get your feet wet with international travel outside of Germany, but it is unforgettably beautiful. At a time when the grape leaves of this famous wine region are just unfurling, its picturesque villages — considered some of the most beautiful in France — welcome spring with a multitude of festivals and gastronomy fairs. Two Easter markets are nestled in the lovely Ancienne Douane Square and the Dominicains Square, allowing guests to stroll along small historic alleys while taking in the architecture, booths, street music, city farm and egg hunts. For details, visit www.printemps-colmar.com (available in English). www.festival.artefact.org (not available in English). The courses take you through vineyards, forests and charming village centers. As an added incentive, each participant receives a bottle of crémant d’Alsace (sparkling wine) at the finish line. For details, visit www.pdv.colmar-marathon.fr (not available in English). Looking to recreate the overflowing flower boxes of France at home? Stock up on seedlings at this exhibition and market of international plants set in the idyllic surroundings of the meticulously landscaped Schoppenwihr Park. For details, visit www.schoppenwihr.com (not available in English). For some quirky fun and an excuse to visit Colmar, try “France’s most important event concerning antique radios.” The exhibition and sale takes place from 7 a.m. until 4 p.m. at Place Jean Monnet square. welcomes the Count Basie Orchestra to its lineup with a special jazz after-club free for attendees. For details, visit www.jazz-festival-munster.eu (not available in English). photo exhibitions and games for children. For more information, visit www.foireecobioalsace.fr (not available in English). Most paths are stroller-friendly and leashed dogs are allowed. More information for the events is available at www.ribeauville-riquewihr.com/en/entertainment/events.htm (available in English). Mittelwihr enjoys one of the highest elevations in Alsace, which equals great views. This historic village has many buildings dating to the 16th century. In spring, cherry blossoms fill the orchards of this town, which has been declared a “zone of tranquility and silence.” Depart from the Place des Fêtes. Walk through the Grands Crus Sonnenglanz and Mandelberg vineyards accompanied by musical entertainment. By reservation only at www.bgbeblenheim.fr. Rallye of the Grands Crus. A trivia contest along the way has an appealing prize: the winner’s weight converted into bottles of wine! Author Jenna Harrison shares more travel tips at www.FollowBenandJenna.com.